Some researchers have noticed a great tendency among Synesthetes to personify fonts as well as other objects. I certainly share that trait as is evident in the titles of my work. My titles are the words that pop into my head when I look at images after I take them. Interestingly, those words never change. I can pick up a photo I haven't seen in ten years, and a title will pop into my head as if for the first time; only when I turn it over, I see that I wrote the exact same thing ten years before. It is unfailing and uncanny and true. The personification that pops into my head remains the same over time. 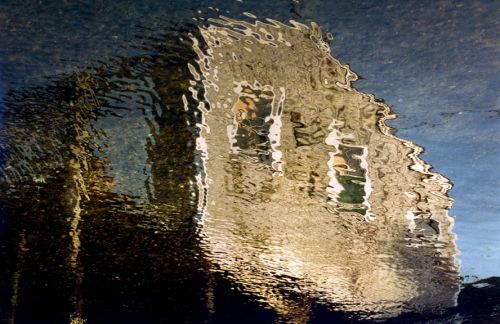 All of the houses I photograph in reflection look like people to me. Actually, they ARE people to me: windows are eyes; bridges are mouths, lights on water become dancers. Yet, my personifications are not self-conscious metaphors. Rather, they represent what I feel before I have time to think or correct my initial perception to match it to what other people take for granted. Secondarily, I know that I am photographing houses, not people. My tendency to personify inanimate objects is not limited to reflections or houses -- I pretty much do it with everything I look at including fonts on a page, which take on gender and personality. In addition, there is a highly personal aspect to the personification process that creates an unusual collection of self-portraits for me. Different houses that I photograph represent different states of consciousness and unconsciousness that I travel into and out during my process. 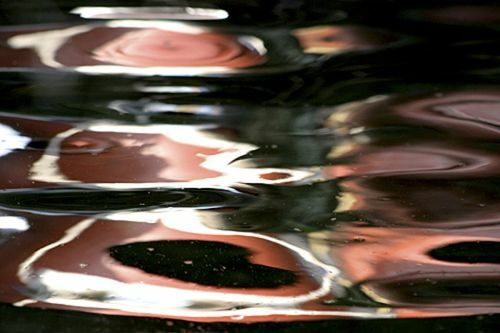 I watch changing patterns on moving water until the pattern takes on a form that matches what I feel; then, I shoot The image I bring home is a portrait of me or of how I felt when I snapped: I photograph my emotions. For more examples, please visit my galleries "Personification" and "Shapes I Become." 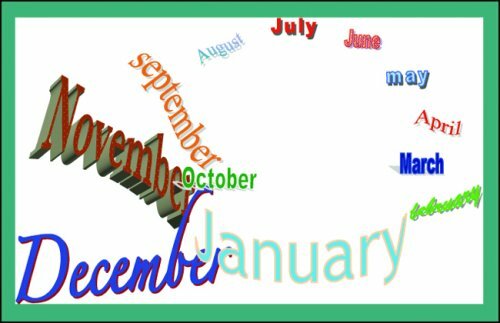 Months of the year are arranged (in my mind) around an oval with permanent positions. The months themselves do not move. I see January in the center at the bottom of the oval which is spatially closest to me; the other months are arranged in a counterclockwise direction so that February (which is light green) is to the immediate right and a little higher than January (pinkish white) while December (royal blue) is to the left of January and slightly lower. At the top of the oval are August, July and June and so forth. Each month has a unique shape and size. To learn more about how I see time, click under the image "Weekends Are Taller Than Weekdays" and visit my blog. I watched the water until I felt the pink turn to satin against my skin. I watched the circles of color dilate and contract, form and reform until I felt myself become one with that motion. Only then -- when I was free of thought -- did I snap the shutter. A few days later, I saw a painting that reminded me of my new image, on an archetypal level anyway. When I discovered that the painter was Wassily Kandinsky, I wondered if he had same kind of synesthesia I have. Texture is one of the signals I rely on when I take my pictures. If what I am looking at produces a sensation of silk or satin against my skin, e.g., I know it is a take although that kind of knowing has nothing to do with knowing in the usual sense. It is an intuitive knowing, a felt awareness that is brought to my attention by my synesthetic responses. To see more examples of texture-inspired images, please visit my Texture and Touch gallery.